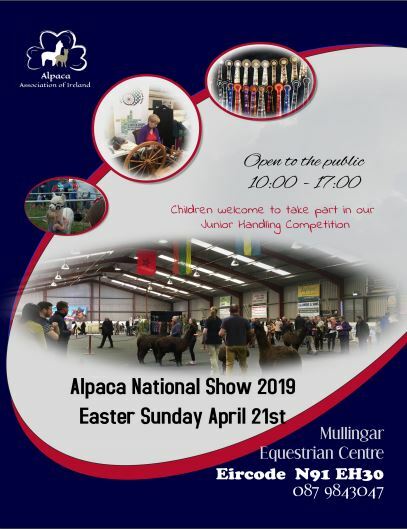 The Alpaca Association of Ireland (AAI) will host its annual alpaca fleece show on Easter Sunday, April 21, in Mullingar Equestrian Centre. “This is our second year hosting a standalone alpaca event. Following on from the great success of last year, 2019 promises to be even bigger. Over 120 alpacas are expected on the day with 30 exhibitors proudly displaying their alpacas,” said Paul MacDonnell, chairman of the AAI. “Apart from the friendly competition, it’s a great opportunity for the public to come visit the various breeders and see the alpacas on display. You can ask all the questions you need answered and there’s always a great family friendly atmosphere,” said Paul. “On the day too, we have face painting and refreshments. There’ll be an alpaca halter competition for the kids and displays on all aspects of alpaca husbandry from shearing to skirting fleeces. “This year is the first year we will have the AAI national craft show. We’re encouraging people to enter their arts and crafts that are Irish made from at least 50% alpaca. A photo competition showing some of the more funny and cute aspects of alpaca farming is also being run, so get those phones out and start snapping,” Paul said.